In 1904 the city of Baltimore was almost destroyed by a fire that raged out of control. Hundreds of firemen, policemen, soldiers, and citizens battled the blaze for almost three days. By the time the fire ended, over 100 acres of land had been burned and more than two thousand businesses were destroyed. The disaster brings out the best in man and the bravest of deeds but one hero stands head and shoulders above all – literally. Goliath is a fire horse assigned to Engine Company 15. 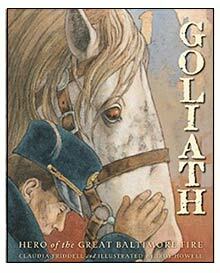 Goliath is massive in size (weighing one ton) and mighty in heart and steadfastness. To the men of Engine Company 15, he is known as the ultimate fire horse. He is the lead horse for the team assigned to pulling the mammoth Hale Water Tower No. 1. 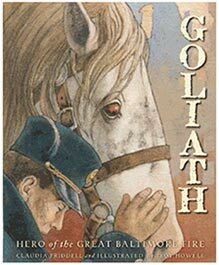 When the fire alarm sounds, calling them to action, Goliath leads his team into the blaze. Soon his lifesaving actions will lead him into the pages of history. 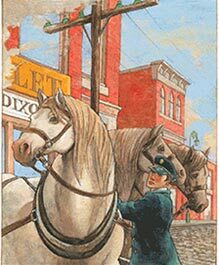 Accompanied by masterful artwork from acclaimed illustrator Troy Howell, author Claudia Friddell brings this true story from Baltimore’s past to vivid, pulse pounding life. Though not as well known as the Great Chicago Fire, the Great Baltimore Fire of 1904 was one of the most destructive in U.S. history. 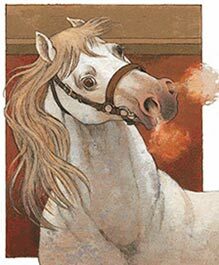 Friddell brings the event to life through the true story of a huge horse from Engine Company 15. Goliath bore the full brunt of an explosion and then heroically pulled an entire fire rig to safety by himself. The text builds suspense as it traces the path of the fire, ending with Goliath’s scarred but triumphant return to his post six months after the fire. Howell’s expressive, sepia-toned illustrations interplay with the text to keep readers in the moment. Exciting, historically accurate, and visually appealing, this book is an excellent addition to the classroom or the pleasure-reading pile. Here’s a few illustrations from the book! 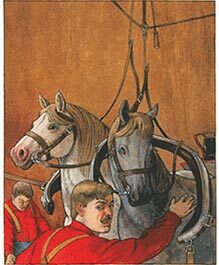 "Goliath, Hero of the Great Baltimore Fire" is an illustrated children's historical book about a brave, larger-than-life fire horse named Goliath who pulled the Fire Engine 15 to help put out the 1904 great Baltimore fire... "Goliath" is a great historical experience book for readers ages 6-12. Additional information about Goliath and the Great Fire of Baltimore are found in the Afterward and the list of Fire Terms at the end of the book. 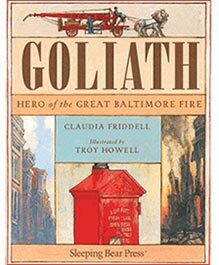 This true story of the devastating Baltimore fire of 1904 and its hero, Goliath, is exciting, eloquently told, and beautifully illustrated. 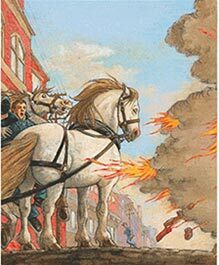 The Great Baltimore Fire, Children are drawn into this compelling adventure with its colorful artwork and spell binding story of the challenges of yesteryear when fire engines were towed to raging fires by teams of horses.